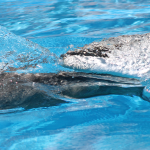 There are currently 10 dolphins living in Las Vegas. 2 from the wild, 2 from SeaWorld, and 6 born under the Mojave sun. Duchess- Captured September 4th 1981 at around the age of 4 years old from Texas waters. 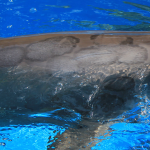 She is the largest female and has a jagged dorsal, white streaks on melon, and white on left pectoral flipper. Offspring: Squirt, Bugsy, Pablo, HufNPuf, Maverick, Sgt. Pepper, and K2. Grandoffspring: Bella, and Miramar. She was transferred back and forth between Dinnes Memorial and Milwaukee Zoo several times between 1982-1989 as property of Quinlan and Dinnes. She used to perform under the name of Nugget when she was in Milwaukee Zoo, named in a McDonalds contest. Lightning- Captured from the wild on August 10th 1989 at around the age of 10 years old from the Florida Panhandle. Transferred from Gulf World Florida on April 9th 2006. He has curved tail flukes, and his dorsal leans slightly to the left. Offspring: Indie, Ripley, Zoe, Venus, Maia, Luna, Sgt Pepper, Bella, K2 and Miramar. Grandoffspring: 2009 & Chloe. 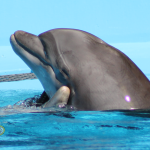 HufNPuf- She was born at the Mirage on March 7th 2000. Her parents are Duchess and Banjo. 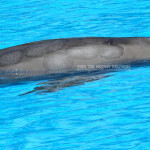 She has a narrow face, light white streaks on her melon, white freckles just below dorsal, and is smaller than Duchess. Her offspring are Bella and Miramar. 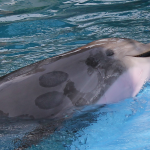 Maverick- He was born at the Mirage on February 27th 2003 to Duchess and Banjo. He has perfect flukes, and a narrow face. He is commonly identified by his poxvirus. He is currently covered in circular lesions. He has shown signs of this disease for over 2 years. 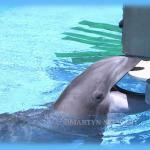 Osbourne- He was born at Seaworld Texas on August 5th 2005. His parents are Nacha and Gilly. 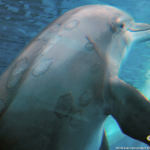 He has white on his dorsal. He arrived in Las Vegas on March 28th 2010. Sophie- Sophie is the newest female to the group. 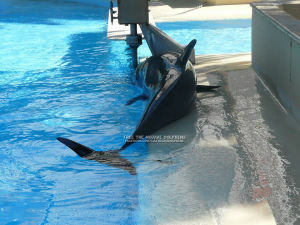 She was born October 6th 2005 at Seaworld San Diego. Her parents are Sandy and Sparky. 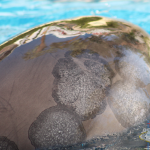 She arrived at the Vegas facility on March 26th 2014 on a breeding loan from Seaworld. She is identified by her rake marks. 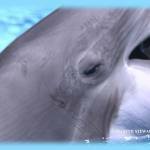 Bella- She was born at the habitat on September 6th 2008 to HufNPuf and Lightning. Her birth marked 3 generations of dolphins swimming in the desert. She is the smallest female. 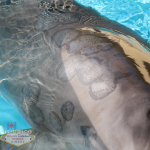 She has a wrinkle like mark on the edge of dorsal and blowhole. K2- K2 was born on July 3rd 2011 to Duchess and Lightning. 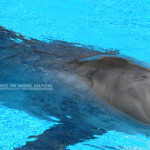 He has a big dorsal fin, white on his sides, and a wave like scar near his let eye. He also has a rusty dot under his chin. 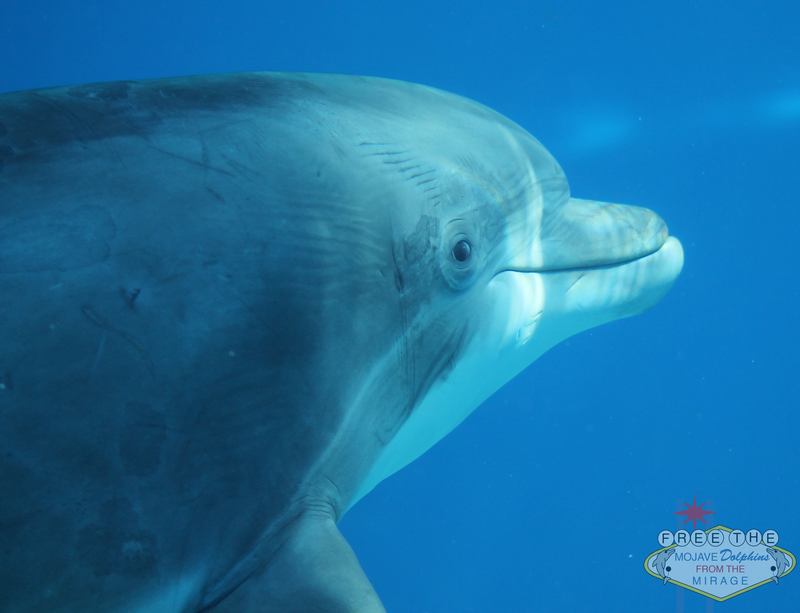 Miramar- He is the youngest male of the group. 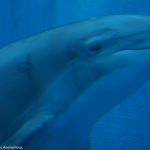 Miramar was born on August 20th 2011 making him just weeks younger than his cousin K2. He has a smaller, darker dorsal and he is the shortest calf. Coco- She was born July 17th 2017 to Huf-N-Puf and Lightning. 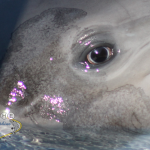 13 dolphins have perished in the backyard of the Mirage Hotel and Casino in the Mojave desert. Darla- Captured June 27th 1987. Died August 5th 1999. Cause of Death: Severe chronic necrotizing pancreatitis/hemorrhage&edema (Originally captured for Marineland Antibes in France but was never sent overseas. 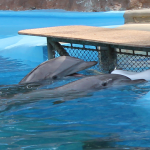 Victims of captivity at the hands of the Mirage Hotel. They may be gone, but they will never be forgotten. 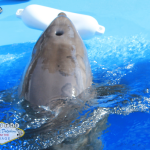 Stereotypical behavior, or abnormal behavior, in dolphins is a symptom of lack of stimulation and boredom. 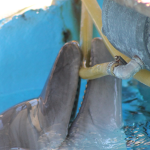 While in captivity, these dolphins are reduced to small barren tanks, kept away from certain members of the pod, and are told when to eat and exercise. The dolphins at the Mirage are no different. Only the main tank has a coral bottom, and to be honest, I never really see the dolphins interacting with it much. Even when they have their “enrichment toys”, you will find them waiting at the gate. Even with a toy, these dolphins wait at the gates. 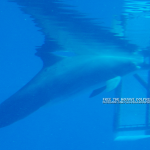 A dolphin waits at the gate in the main pool. You can see how barren their environment must look to them. 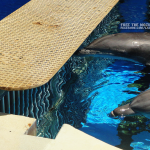 Dolphins wait at both sides of the gate between main and center pools. Maverick and Osborne display aggression in the main tank August 2014. They went after each other for quite awhile with no intervention from trainers. 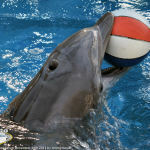 There’s an abundance of evidence that shows that dolphins and whales in captivity show a lot of the same abnormal behaviors that are exhibited by other animals in captivity. These include things like stereotypes where they do repeated movements, self mutilation and just basically other behaviors associated with being psychologically disturbed. 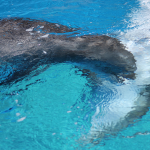 There are also several peer-reviewed studies that have shown elevated stress hormones in dolphins and whales in captivity. 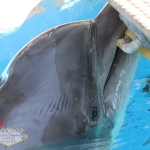 So there really is no way that an artificial setting could provide an opportunity for the range of natural behaviors that dolphins enjoy in the wild, just from a physical point of view. The largest tank in the world is something like less than one ten-thousandth of one percent of the natural range of most dolphins and whales. 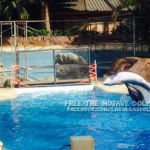 So there’s physically no way that these animals could exhibit natural behaviors in captivity. 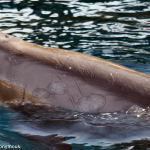 Poxvirus is a disease that forms skin lesions on dolphins. 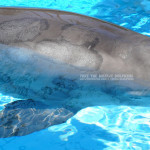 It has been observed in both free-ranging and captive bottlenose dolphins.The large patches are made up of smaller spots. The color and size can change rapidly. 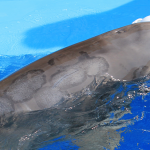 The disease occurs frequently in captive dolphins and is endemic in some colonies. 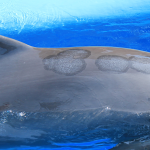 Dolphinpox is not contagious to humans like the pinniped version of the disease. In captivity, there appears to be a correlation between pox-like lesions and stress, environmental conditions, and the overall health of the animal. Poxvirus is not immunosuppressive unlike the cetacean morbillivirus. Poxvirus could worsen due to water temperature and quality, salinity levels or periods of environmental, physical, and/or mental stress. 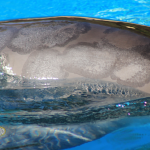 Dolphins under natural conditions often tolerate salinity changes, yet in captivity they have been destroyed by the combined effects of an otherwise mild disease superimposed on a severe skin condition resulting from overly dilute water. We have been reporting on Maverick’s condition with the poxvirus since January 2014. He has shown signs of the disease for a minimum of 2 years. 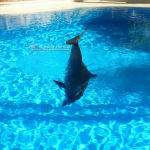 The disease did not pop up in the Mirage habitat until just months after Seaworld Orlando shipped Beetle and Cosmo over. This according to photo evidence archived on Flickr. Orlando is still dealing with the poxvirus as shown in photos sent to me in August 2014. Update: As of January 2015, the Poxvirus at the Mirage is clearing up.